Prediabetes was never on Alma Schneider’s radar. Why would she worry about a condition that can lead to type 2 diabetes when her life’s work is teaching people how to create healthy home-cooked meals? Not to mention that she diligently practices what she preaches in her own kitchen…she’s not overweight…and she exercises. That’s why she was thrown for a loop when her doctor called last year with the results from a routine checkup. Her blood showed that she was very close to having prediabetes…then things got worse and she was prediabetic. Her story has lessons for nearly all of us. After all, 86 million Americans have prediabetes. So there’s plenty of worry to go around. What appeared to be Alma Schneider’s losing battle with her rising blood sugar highlights an important debate in the medical community. Does getting a prediabetes diagnosis really help—or is it just another medical label that makes people feel bad about themselves? Does one size really fit all? 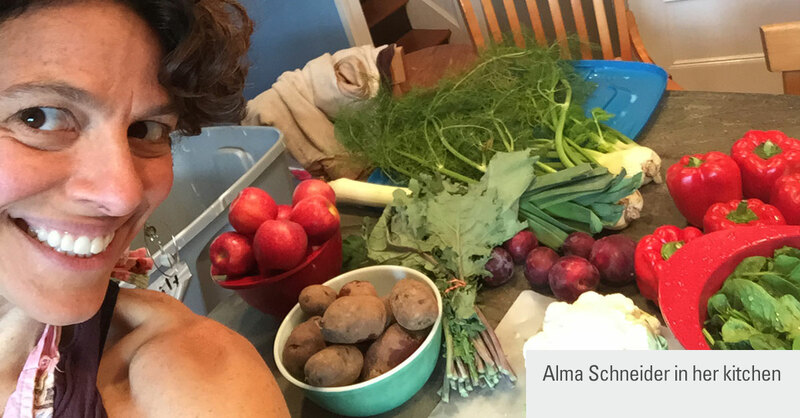 Check out Alma’s story—and the lessons one respected diabetes expert draws from it. A cooking coach and author of Take Back the Kitchen: Identify and Own Your Cooking Personality Type and Get Cooking!, Alma Schneider is a clinical social worker and creator of Take Back the Kitchen, a lifestyle program that helps people overcome obstacles to cooking healthy meals at home. Forty-seven at the time, Schneider was shocked at her blood test results but also frustrated with her doctor’s seemingly automatic advice to clean up her diet and increase her activity. She already cooked most of her meals from scratch with whole “real” ingredients. She already avoided added sugar. And she already worked out three times a week. There wasn’t much more she could change, but she did what she could. No more dried fruit (it’s got a lot of concentrated natural sugar). She limited even healthy carbs, including whole grains, such as brown rice, and sweet potatoes, which are high in fiber. Instead of bananas, which contain a fair amount of natural sugar, she switched to berries, which contain less. She started eating more foods that are low on the glycemic index—meaning they cause only a gradual, modest increase in blood sugar—such as lentils. As it happened, three months later Schneider had an appointment with her endocrinologist (whom she saw regularly, having had thyroid cancer a decade earlier). She insisted he do a repeat blood test. The result: Her blood sugar had risen further, with her A1C, a score that indicates blood sugar over the previous three months, edging up from 5.5 to 5.7—officially prediabetic, albeit at the lowest end of the blood sugar range for that label. She chronicled her struggles in a series of humorous blog posts with titles such as How My Body Betrayed Me Following My Carb Revenge and Could I Belly Dance My Way Out of Prediabetes? Was she overreacting? How important is prediabetes anyway? The definition of prediabetes is straightforward. The American Diabetes Association defines the condition as having levels of blood glucose—aka blood sugar—that are higher than normal but not quite high enough to qualify as full-blown diabetes. That translates to an A1C between 5.7 and 6.4. Above that level, it’s type 2 diabetes. Most of the time, prediabetes has no symptoms. Here’s why it matters: Without lifestyle changes, as many as 70% of people with prediabetes will develop full-blown diabetes within a decade. But lifestyle changes can upend those odds. A not-very-difficult structured lifestyle program can cut the risk by 58%—and that goes up to 71% in people over age 60. Losing even a small amount of weight—5% to 7% of body weight or 10 to 14 pounds for someone who weighs 200 pounds—is a key part of that approach. But not everyone is happy with diagnosing so many millions of people—including 80% of Americans over age 60—with prediabetes. Some bloggers, citing arguments in the medical community, write that it just makes people feel bad about themselves, “medicalizes” and labels them, and doesn’t really help them change. Instead, they argue, we should focus as a society on encouraging healthier eating and more exercise for everyone. Alma Schneider certainly had a strong emotional reaction to learning that she now fit into the high-risk group of “prediabetics”—it challenged her self-image. Yet while the “prediabetic” label may be controversial—since most of us already know we should be eating better and exercising more and watching our weight—it serves an important purpose, says Gerald Bernstein, MD, coordinator of the Friedman Diabetes Program at Lenox Hill Hospital in New York. Why? By reinforcing the need to be vigilant about trying to prevent type 2 diabetes—and by giving patients a measure of their progress on the path to prevention. If a patient falls into a prediabetes range for whatever reason, she and her doctor must figure out what to do from there. For most people, lifestyle modifications are a good first line of defense. (Sometimes the drug metformin is also prescribed to reduce the risk for progression to type 2 diabetes.) An A1C test result in the prediabetes range, Dr. Bernstein notes, does not mean that diabetes is inevitable. Indeed, a rise in A1C from 5.5 to 5.7 is not particularly concerning, notes Dr. Bernstein—unless it continues to go up every few months. In Alma’s case, it didn’t. Now more than a year later, it’s still 5.7—and her endocrinologist now checks it only once a year. Still, he applauds Schneider for taking this seriously and searching for ways to tweak her lifestyle to reduce her blood sugar. There’s another lesson to be learned here, too—your health is not defined by any one number. While Dr. Bernstein thinks a prediabetes diagnosis is a wake-up call for anyone, he emphasizes that everyone’s case is individual. Clearly, the numbers Schneider got from her A1C test weren’t the whole picture. Her healthy habits put her ahead of the game. Her other numbers, such as blood pressure and cholesterol, were just fine. Indeed, her own primary care doctor reassured her that it was unlikely she’d develop diabetes as long she kept up those habits. Alma was shocked by her diagnosis of prediabetes…then she worked extra hard to eat more healthfully…and then she rebelled against that stringency by eating an excess of carbs. Eventually, she figured out a balance that works for her physically and emotionally. Rely on fresh whole foods as much as possible. There’s so much added sugar in prepared and restaurant food it’s hard to know what’s in your meals unless you start from scratch as often as you can. Fill your kitchen and pantry with healthy staples. Rely mostly on vegetables, low-sugar fruits such as berries, lean protein and complex high-fiber carbs such as brown rice rather than white. Head off hunger. To avoid mindlessly reaching for high-calorie, high-fat, low-nutrition items when you get hungry for a snack, keep easily-accessible, ready-to-eat whole foods on hand. Try hard-boiled eggs, cut-up veggies, hummus, edamame dip. Put together little bags of nuts to keep in your car so you don’t stop at a gas station and pick up something unhealthy if you get hungry on the road. Make your own healthier chips. Are you in a “can’t eat just one” state of mind? Instead of reaching for commercial potato chips or other snacks, make your own kale chips: Toss five cups of kale pieces with enough olive oil to lightly coat them, sprinkle with salt, spread on a wire rack set atop a baking sheet, and bake in a 350-degree oven until crisp (about 15 minutes). Use low-carb flours. If you’re craving something baked, experiment with using almond or coconut flour, which are lower in carbs than wheat flour. They also make a tasty breading for chicken cutlets and fish fillets. Satisfy a sweet tooth by creating desserts that include fresh fruit flavored with coconut milk or cinnamon, both of which are naturally sweet with little or no added sugar. Most important, forget trying to be perfect. What Alma Schneider learned from her prediabetes saga is to relax and accept that she’s a pretty healthy person—and she doesn’t need to hit the perfection mark every moment. To see where she landed, read her latest blog post on the topic, Managing My Prediabetes with Kale and Ice Cream.